Screen shots from Taobao via HKFP. 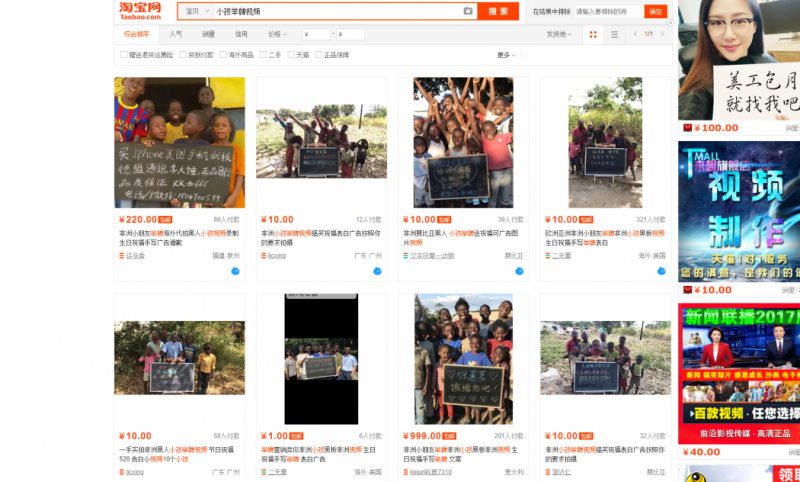 Chinese Taobao vendors engaged in the sale of customised online photo and video messages that feature African children have faced a storm of criticism from commentators who view the practice as exploitative and racist. The services are advertised on China’s most popular online shopping platform, Alibaba’s Taobao marketplace, as a “meaningful” way to deliver a personal message. 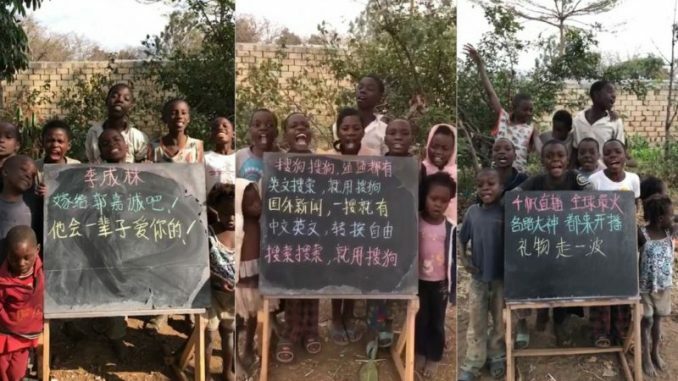 Listed by multiple vendors, the videos feature children from unspecified countries in Africa reciting custom-ordered messages in Mandarin while holding aloft signs. The video messages target birthdays, anniversaries and even marriage proposals. Sample photos on vendors’ profiles also show children reading out advertisements for businesses such as dental practices, home refurbishment companies, and the Chinese search engine Sogou. Screen capture of the search result of “Kids holding placards” on Taobao marketplace. Via HKFP. The controversy over the clips feeds into broader concerns over the nature of China’s role in Africa. Beijing took over the United States as the continent’s largest trade partner in 2009, but some Chinese companies have been accused of echoing the exploitative practices of European powers during the colonial era. Prices for the video clips range from RMB 10 to RMB 220 yuan (approximately US$ 1.5 – US$ 35 dollars). Buyers who opt for the higher price bracket receive a 10-20 second video featuring around ten children reading out a message in Mandarin, responding to instructions from the videographer. Those who purchase cheaper packages receive a photo of a child holding a sign with a handwritten message. Videos are usually completed within 24 to 72 hours of being ordered. Children are not merchandise. You can’t choose from different video clips. Thank you for understanding. One vendor advertised their videos as a form of “charitable activity.” Posing as a potential customer, HKFP asked whether the price of a video would cover compensation for the children involved in its production. Another vendor said the children “are considered to be employed”. When asked about how young the children were, the vendor said that he did not know the details of the production, but that the children were “definitely reimbursed” for their participation. Beijing Youth Daily spoke to a Chinese photographer who had previously produced similar video messages in Zambia. The photographer said that the children who featured in videos were only compensated with small snacks, or a few dollars each. The people filming the clip received approximately RMB 90 (approximately $15) per video, which were then sold on Taobao by a vendor for double the costs of production. Taobao has said it had received complaints regarding certain vendors using African children for suspected violations of Chinese advertising law, which state that advertisers may not use “superlative expressions” in their promotional materials. The company said that it would take down the products if the complaints were valid. Users had previously criticised the vendors for allowing custom-ordered messages to include inappropriate content, including promotional phrases such as “the best,” “the most well-loved,” and “even the Africans know it!” as well as advertisements for pornographic live streams. Some vendors note in their descriptions that custom orders cannot include swear words, sexual innuendos, mentions of gambling and drugs, or superlative advertising. As this article went to publication, there remained multiple vendors offering their services on the online marketplace.